Rebecca High and her two pigs, Phoenix (left) and Jett (right). Penn Manor FFA students showed their cattle, pigs and goats at the West Lampeter Fair from Sept. 28-30. Rebecca High, sophomore, showed her two pigs, Phoenix and Jett, on Wednesday, Sept. 28. The two pigs were in the Heavyweight division and both received a ribbon, one for second premium and one for third. High also received a ribbon herself for showmanship. This was her third year showing pigs and she intends to show again next season. Sophomore Tabitha Swope showed her dairy beef cattle on Thursday, Sept. 29. This was her fifth year showing dairy beef; however, she plans for this to be her last season so she can focus more on academics. Experiences can differ from year to year. Swope said that the first time she received a blue ribbon, her cattle ate it, but she does always hope to receive another blue ribbon. Even though High hasn’t showed for as long, she still has some advice to give. “You definitely have to work with your pigs” she said, to make sure they show well. When showing an animal, students start fresh each year by raising the animal from a calf or a piglet. The students care for the animals for several months until fair season, when they show and sell the animals. High said that she received her pigs a few weeks early this year, and that had a fairly large effect on the results. She said that the pigs gained weight too fast, and that she had to adjust their diet in order to keep the pigs in their weight division. 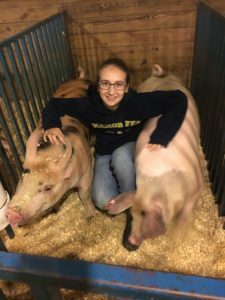 The idea behind having students entered in the farm fairs is “to gain experience in agriculture,” as agriculture teacher Mr. Neil Fellenbaum said. However, not all students who show do so just for agricultural experiences. High stated that she started showing animals because she was asked by her brother her first year, but enjoyed it so much that she has continued. FFA students who enter projects in farm fairs do it of their own decision and not as a part of class. Mr. Fellenbaum said that these are called Supervised Agricultural Experience (SAE) projects, and the student choose based on their own interests. These projects are mostly completed outside of class, but there is limited class time set aside to plan and update the projects. There are also certain limitations on where a student can show and who can enter. Mr. Fellenbaum stated that a student must be a member of FFA in order to show animals, and according to Swope, students can only show certain animals at certain fairs.